Pakistan's Prime Minister, Chaudhry Shujaat Hussain, has vowed to pursue peace with India and resolve the two countries' differences. Mr Hussain was speaking at the start of a South Asian regional summit in the Pakistani capital, Islamabad. The foreign ministers of India and Pakistan are expected to meet for peace talks on the sidelines of the forum. Relations between the two nuclear rivals have been improving steadily in the past six months. "I want to assure all members of Saarc and indeed the world that Pakistan is committed to pursuing peace with India," he said. The BBC's Paul Anderson in Islamabad says all eyes are trained on the expected meeting between the Pakistani and Indian foreign ministers. 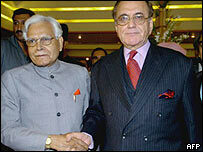 It will be the third time India's Natwar Singh and Pakistan's Khursheed Mahmud Kasuri have met on the sidelines of a summit in a month. But analysts say they do not expect major breakthroughs and say the talks are another opportunity to build trust between the two countries. Peace talks between the two countries began earlier this year after months of hostility. Six more rounds of talks are planned over the next month and a half. Mr Singh told reporters a meeting with Mr Kasuri had been put off to the first week of September because of scheduling problems. The Saarc meeting in Islamabad is aimed at finding ways to reduce poverty in the region. More than 1.5 billion people live in the seven countries that make up the region which is afflicted by endemic poverty. 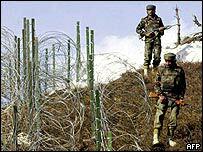 In the past, meetings of have been held hostage to the strained relations between India and Pakistan. But correspondents say hope for the region is rising because of the improved ties between Delhi and Islamabad. "There was an overwhelming consensus that poverty alleviation was the overarching concern for Saarc region as a whole," Pakistan's Foreign Secretary Riaz Khokar, told journalists in Islamabad after a meeting of top diplomats. "We have talked in terms of setting up an energy centre because please do not forget that South Asia is a region which is starved of energy." A regional free trade pact, to be created by the beginning of 2006, is also high on the agenda. "A conference billed by member states as a real breakthrough"